On January 31, 1810, the State of Ohio authorized the creation of Coshocton County. The county's name comes from the Delaware Indian word for "black bear town." The Delaware Indians' territory centered in modern-day Coshocton County until white settlement led the tribe to move further west in the years following the American Revolution. County residents began to prosper with completion of the Ohio and Erie Canal. Thanks to the canal, Coshocton became a major commercial center in eastern Ohio during the 1820s and 1830s. Coshocton County is located in east central Ohio. It is predominantly rural, with less than one percent of the county's 564 square miles consisting of urban areas. The county seat is Coshocton. 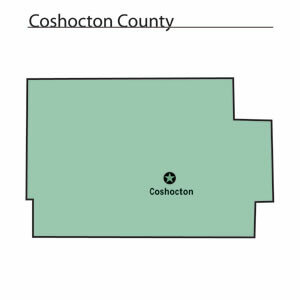 With a population of 11,682 people, Coshocton was the county's largest community in 2000. The next largest urban area, West Lafayette, had only 2,313 residents in that year. Coshocton County experienced a slight increase in population -- roughly 3.5 percent -- between 1990 and 2000. This raised the total number of residents to 36,655 people. The county averages sixty-five people per square mile. The largest employers in Coshocton County are manufacturing establishments, with service industries a distant second. During the early twentieth century, Coshocton became famous for its advertising products, including calendars, trays, and other items promoting businesses like the Coca-Cola Bottling Company. In 1999, the per capita income in the county was approximately twenty-one thousand dollars, with 11.5 percent of the people living in poverty. Among Coshocton County's more prominent residents was William Green, a past president of the American Federation of Labor.